Click the Change Chart Type button in the Type group to change the type of chart, for example, to change from a bar chart to a line chart or a pie chart. 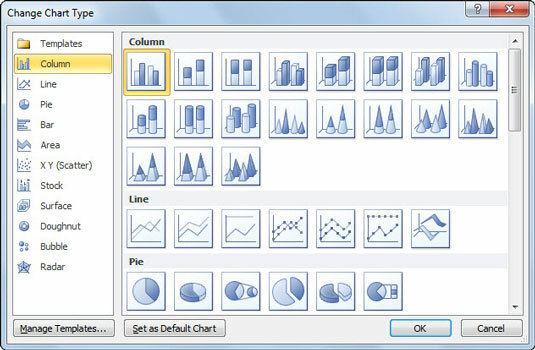 Just click the thumbnail of the new chart type in the Change Chart Type dialog box that shows all the kinds of charts in Excel. Click the Save As Template button in the Type group to open the Save Chart Template dialog box, where you save the current chart’s formatting and layout (usually after customizing) as a template to use to create future charts. Use the Change Chart Type dialog box to switch to another chart type. Click the Switch Row/Column button in the Data group to immediately transpose the worksheet data used for the Legend Entries (Series) with the data for the Axis Labels (Categories) in the selected chart. Click the Select Data button in the Data group to open the Select Data Source dialog box, where not only can you transpose the Legend Entries (Series) with the Axis Labels (Categories), but you can also edit out or add particular entries to either category. Click the More button (the button with the horizontal bar and triangle pointing downward) in the Chart Layouts group to display all the thumbnails on the Chart Layouts drop-down gallery. Then click the thumbnail of the new layout style you want applied to the selected chart. Click the More button (the button with the horizontal bar and triangle pointing downward) in the Chart Styles group to display all the thumbnails on the Chart Styles drop-down gallery. Then click the thumbnail of the new chart style you want applied to the selected chart. Note that the Chart Layout and the Chart Styles galleries do not use the Live Preview feature. This means that you have to click a thumbnail in the gallery and actually apply it to the selected chart in order to see how it looks. 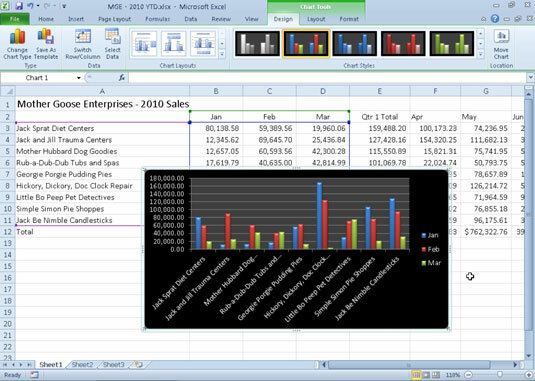 Embedded clustered column chart after selecting a new chart layout and color style from the Chart Tools Design tab.